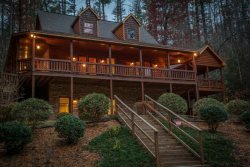 When you lead a busy, hectic, overscheduled life, you need the peaceful, quiet respite that a Georgia mountain cabin rental provides. You'll find it at Cartecay River Dreams, the perfect place to slow down, decompress, breathe the fresh mountain air, and relax in an idyllic wooded, waterfront setting. Surrounded by trees in a gated community in Ellijay called The Bluffs of Cartecay, this gorgeous Satterwhite-built log home sits on two secluded acres with over 200 feet of Cartecay river frontage and no other cabins in sight. It's the ultimate in privacy, but less than 2 miles to shopping, four miles to restaurants and antique shopping in Ellijay and just a few miles to downtown Blue Ridge. If you love the water, you can enjoy it in several forms here, whether it's listening to the sound of the rushing river from the back deck or the brook from the front yard, soaking in the hot tub or sitting by the back yard water feature. The Cartecay River is just steps from the back door so you can fish to your heart's content and grill your catch for dinner on the outdoor grill overlooking the river. The outside areas are designed for outdoor living with rockers and patio chairs to relax in, a 50" TV, wraparound porches and 3 firepits to warm you. Inside, the cabin is a beautiful mix of rustic elegance and modern comfort, with soaring vaulted ceilings, hardwood floors and large windows overlooking the Cartecay River providing a bright and airy feel and wildlife decor to highlight the nature theme. Reclining chairs, sofa and loveseat, a stacked stone gas fireplace and 65" TV with DVD make the great room a warm and welcoming place to relax and unwind. The spacious kitchen is fully equipped and furnished with solid wood cabinets, granite countertops, stainless steel appliances, an icemaker and two coffee makers and the adjacent dining area seats up to seven, plus three at the breakfast bar. You'll slumber in comfort in your choice of three bedrooms, each with luxury bedding, a 50" TV and ceiling fans. The master bedroom overlooks the river and features a king log bed and zero gravity massage chair and a private bath with granite counters, walk in shower, double showerheads, double vanities and a walk in closet. The second bedroom also overlooks the river and features a queen log bed. The third bedroom is set up with two twin log beds. Both share a bath with a step in tub/shower, granite counters and a linen closet. There is a media room over the detached two-car garage, a 50" TV, a full size futon, a multitude of board games for every age and a PlayStation 4 that will keep the kids occupied while parents enjoy some quiet time. Other amenities include WiFi, Direct TV, washer/dryer off the kitchen, paved roads throughout the neighborhood and leading to the cabin, a large gravel driveway with plenty of parking available on the driveway or on the parking pad in front of the garage, a fishing dock and stairs that lead directly into the river. It's dog friendly too so you can bring your furry best friend with you as you enjoy your unforgettable getaway at Cartecay River Dreams.